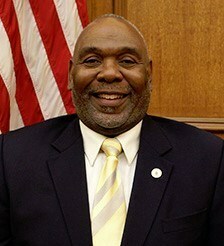 Union County, NJ – On Saturday, February 9, the Union County Board of Chosen Freeholders will recognize lifelong Linden resident Monty Brooks with the seventh annual Chester Holmes Humanitarian Award during the County’s Black History Month celebration at the historic Union County Performing Arts Center in Rahway. The event begins at 7:00 p.m. and features a free concert version of the iconic American musical, Ain’t Misbehavin’. “Mr. Brooks defines humanitarian by devoting his life’s work to students and families, guiding them through hard times and encouraging them to achieve their best. He provides an outstanding example of the great difference that one person can make in our community,” said Freeholder Chair Bette Jane Kowalski. “The saying that ‘it takes a village to raise a child’ is one that perfectly fits Mr. Brooks and his work with our students and their families. He provides a wonderful role model for all of us,” said Freeholder Andrea Staten. A former football, basketball and track athlete at Linden High School, Mr. Brooks previously coached football and basketball teams at the high school, and is currently the track coach. He has mentored many state powerhouse teams and successful student-athletes, including some who have gone on to professional or successful amateur sports careers. Mr. Brooks currently coaches Kyle Lipscomb, currently the number-one ranked shot put thrower and the number-two ranked discus thrower in the state of New Jersey. Mr. Brooks is a NCAA Eligibility Center Specialist at Linden High School, one of the few at the high school level. He ensures that the school’s student athletes and parents are fully aware of all NCAA eligibility guidelines and requirements as it relates to potential Division 1/ Division 2 athletic scholarships. The Humanitarian Award was created by the Freeholder Board in honor of the late former Freeholder Chester Holmes, who was known for his lifelong dedication to community service. Mr. Brooks is the first resident of Linden to receive the award. Ain’t Misbehavin’ is presented through the combined sponsorship of the County of Union, City of Rahway, and the Union County Performing Arts Center. This free concert version of the award-winning musical revue will take place at the historic UCPAC Main Stage at 1601 Irving Street in Rahway, kicking off a month-long celebration of programming in recognition of Black History Month. Ain’t Misbehavin’ pays tribute to the black musicians of the 1920s and 30s Harlem Renaissance, an era of growing creativity, cultural awareness, and pride. It showcases the music of Thomas “Fats” Waller, who rose to fame during the Golden Age of the Cotton Club and introduced a new form of music called swing. Admission is free but tickets are required to guarantee seating. For more information and to reserve tickets, visit ucpac.org/events. Please note that tickets for the event are currently on hold and will be released beginning on January 25 at 12:00 p.m.
For more information, contact the Box Office by email at boxoffice@ucpac.org or by phone at 732-499-8226.